This day belongs to Hannah. "I chose this day to commemorate my birthday. This outfit is so comfortable and adventurous, ready to travel the world. Here's to many adventures to come in the UP LBD!" Hand knit cowl donated by Marcia Barrow Taylor at mbtfinearts.com. The green suede pedal pushers are an old staple, worn with legwarmers and vintage pumps from eBay. Need last minute gifting ideas? Make a gift donation in someone's name and we will send them an eCard with drawings from the Akanksha kids noting your lovely gesture. I looove your pants. I've seen them on you before I think, but they're still awesome. I love the way you look in the fourth photo...so beautiful!! I love the pants. I was with the outfit until the leg warmers. You're too broken up with the dress and the pants and the warmers. This is adorable -- have been wondering though about the long sleeves under the dress -- long underwear? arm warmers? Please advise! Never tire of seeing your ideas. Can't wait to see what will you do christmas day??? love this one! such a rad pair of pants, and gorgeous cowl. cheers! Great people think alike, annie, I totally agree with you that the last picture (esp.) 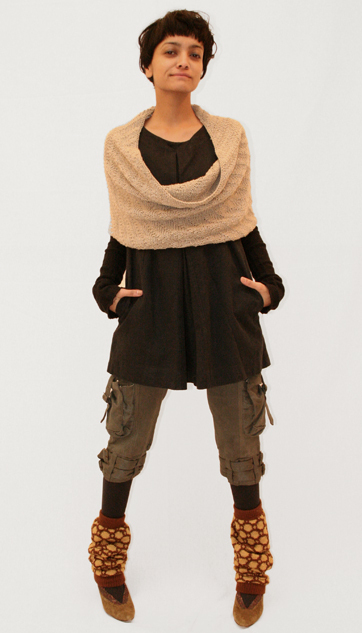 is adorable!Love that amazing cowl, total cozy look! how did you think of this? in theroy it doesnt work but once again you manage to pull it off. keep up the great work. beck tagged this safari fun! this is gorgeous! such warm colors, and the silhouette is fantastic. :) nice to see a bit of a change up from the typical tights-under-the-dress look. love! Viva la Sandinista! very Combat Rock of you to drop the Clash reference (the call up) for the freedom fighter fatigues look. so clever with the play on words. you need to have a chapter in the book on all your eclectic bits of cultural inspiration for the project. titles, styles, inside jokes in the comments section. there's a whole world of ideas in this project that i fear lots of people are missing, and they deserve to be brought to light. the book will need to be thick, but not for the thick. that cowl is gorgeous, but I LOVE the legwarmers. I would love to dress like this everyday - but I'm not sure it would go over well in my small town. Wow! I think I have a new favorite! Love the project. Love this outfit! You go, girl! yipee - another great outfit! Ann Marie tagged this Brains and Stylish! MM is right....you have the brains AND the stylishness! I often wonder if people are too wrapped up in the wraps to get the play on words! I appreciate them too! Fun Fun Fun! I love it when it is fun and gives me ideas!! oops sorry I didn't think it posted..
LOVE this look. every item is perfect and it's perfectly put together. I love your creativity, commitment to sustainability, and improvisational style. However, could a curvier girl pull this off? Or many of your other variations for that matter? Cute and snuggly. The legwarmers don't exactly go with the shoes though. cooool . i reeached the prject that it's first time. it's an un forgettable.! i'll drop into here, every day!? Wonderful colour combination! Looks very warm! i <3 this outfit! the only thing i don't care for are the leg warmers and the shoes, but i Love the tights, shorts, the cowl, and the long sleeve! I love this look! but I would've worn it without the leg warmers. Really like the cowl, leg warmers are fun, but a bit much together, for my taste. Great look, needs closer fitting leg warmers. Though you could also wear on your arms. Hmmmm, liking that last bit. Totally love every aspect of this outfit. Classic and comfy looking at the same time. VERY NICE !!!! Love the outfit! but sorry to be cheeky.... Lose the leg warmers. It would be heaps sharper without them. cosy cowl & comfy pants.... I love those pictures esp:4th one...Totally agree with mm that you ought to have a book at the end of your project which would be very popular - with all those styles , fashion,inspirational- intelligent-humerous & challenging play of words in your daily titles. Ofcourse, with all the daily comments and any chapters added, we will have a feast on that thick book... hmmm I can't help thinking - What would be Sheena's title for her future book ? I really dislike this. There are too many bumps and frumps your pedal pushers. This outfit doesn't flow together at all. Top half is so cool. Anonymous tagged this So Flippin CUTE! Is this a new dress? It looks a different colour! Love this, I see this outfit and I picture a character from a movie a no nonsense badass making her way through the ruins of New York. I love how eclectic this outfit is, very much what I would wear. Keep up the amazing work. I really like it. It is adorable. I follow all the fashion trends and know something about it. I must say that the color scheme is pleasant for an eye. The gaiters complete the image making it fresh and organic. When I worked as a stylist I looked through a lot of fashion magazines and downloaded a lot of photos on search engine on torrent files http://www.picktorrent.com as far as I remember. Those photos formed the basis of my vision of a fashionable image. They are indeed worth attention. Great article, you mention some really interesting point. http://www.rapidsloth.com/Windows-Live-Messenger-v9.0.html you can see oter opinions on the matter. This is adorable, have been wondering though about the long sleeves under the dress long underwear? I seen the pics http://www.rapidsloth.com and im not quite sure about it.